At a time when we are overwhelmed by the sheer amount of information, our aim was to create an unobtrusive experience. So, we drew on unintelligible, unobservable, and underutilized information from the environment, and used this in ColorWalk to tell a story. ColorWalk is a light installation that uses cameras to track the ebb and flow of the crowd movement on a street during the day. At night, it projects these paths in a light show, recounting the story of those who met and those who parted, with every night offering a unique show. We looked for communities that could benefit from such an installation the most. We settled on Corktown, an up-and-coming neighborhood in South West Detroit. In Detroit, small towns and communities are isolated from each other by big roads. ColorWalk can bring these communities together in Corktown, by drawing the curious from around Detroit and offering them a glimpse of the vibrancy of life during the day, as it brings the night to life. We first used Concept Posters, a type of parallel prototyping technique. Each of us created two to three sketches depicting our concept for the project. To ensure the robustness of the final idea, we invited a group of designers and we pitched our ideas. The audience voted for the idea that they thought was the most valuable and visually enticing. ColorWalk came out as the winner. ColorWalk leverages people’s joy of discovery. It recounts the hussle and bussle of daily commotion at night. During the day cameras capture people’s motion in the street. The motion will be translated into light patterns, projected onto the street at night. They emphasize where people’s paths crossed. The shapes highlight cross-overs, giving you an idea of where most people walked through. The patterns are not a one-to-one mapping of individual steps. Initially, we had hoped to track pedestrians footsteps with arrays of pressure sensors integrated into the sidewalk and present the data using LEDs. However, given the cost and reliability issues we had to pivot. A more cost effective method turned out to be a combination of computer vision and motion tracking to collect data and projectors to display the data. We first prototyped our design in the lab. 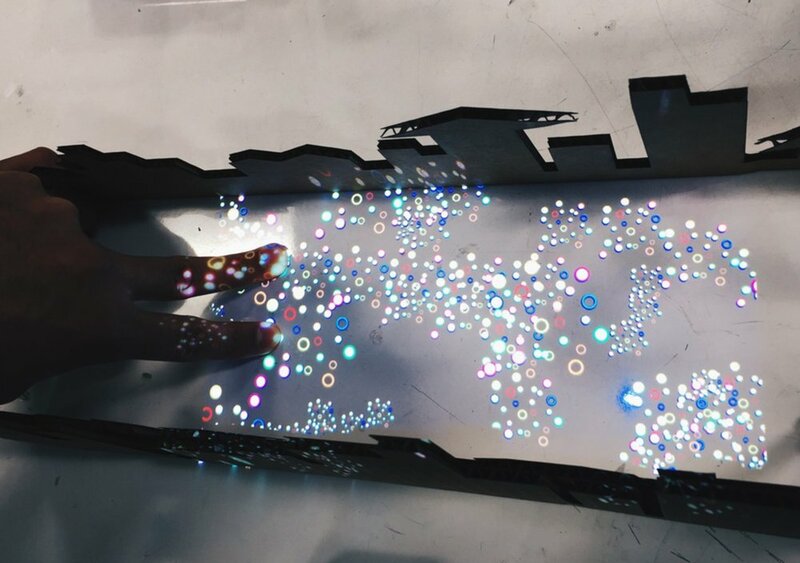 We used a laser cutter to make a mock-up city, and used projectors, and web cameras. We then took our projection to the street.